This recipe for Smothered Pork Chops is a fast meal elegant enough for company but simple enough for a weeknight dinner. 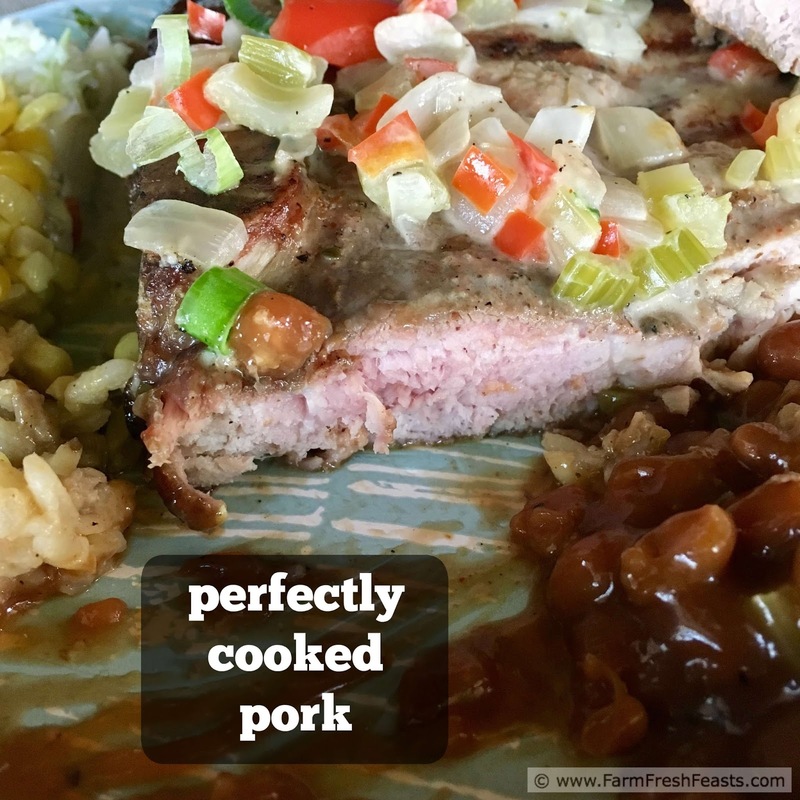 I'm working with the Ohio Pork Council, focusing on everyday recipes using different cuts of pork to share the versatility of this protein. Over the coming year (which, like an academic year or the federal government's fiscal year has nothing to do with the calendar year) I'll be posting a number of recipes as part of this partnership. I'm clear on my purpose for this website, sharing practical support for local eaters, so you know I'll be bringing a local, seasonal perspective to my recipes. Next month I'll be sharing a recipe using ground pork and green tomatoes, then later in the year we'll explore bacon and leftover ham. 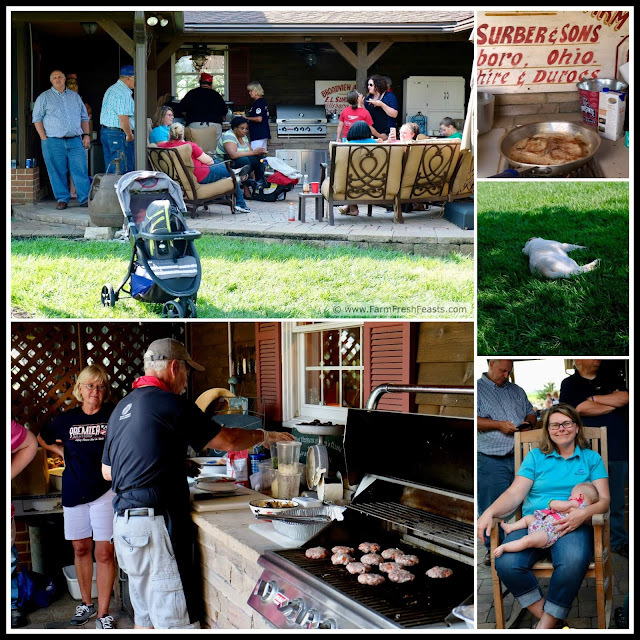 To kick off this series, the Ohio Pork Council invited me along to a farm dinner. "You want me to come out, get fed, then write about it? I'm in." I apologize for the quality of the location photos. While we were coordinating the date for this event, the military up and transferred my spouse to his new assignment in Minnesota so all of the images are mine. 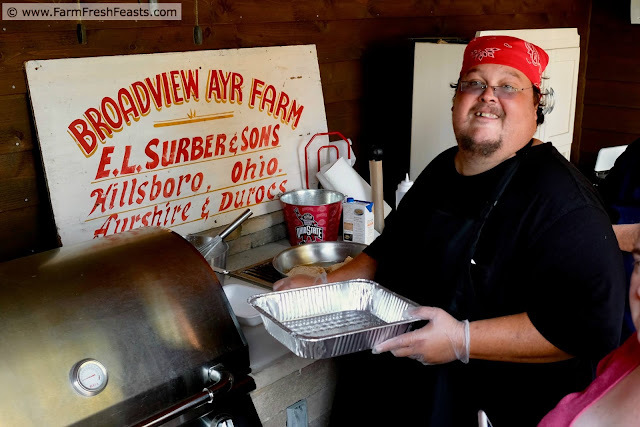 You can see his photographs of Oakview Farms in my post about my visit with the Runyan family, How to Grill the Perfect Pork Chop. To set the stage, here's what I saw when I turned off the highway--a road curving off into the distance with healthy stands of corn on either side. I felt myself relaxing at that moment--the rush to finish up at work (I'd left a pot of cioppino to simmer and raced out the door) and worry about being late melted away. I'm guessing my instinctive reaction is due to my Dad growing up on a dairy farm in Wisconsin. A rural lane surrounded by cornfields = happy childhood memories of visiting my grandparents imprinted onto my subconsciousness. Introspection aside, I was in the right frame of mind when I arrived at the Surber farm. John and Connie Surber are the 5th of going on 7 generations of hog farmers in Sabina, Ohio. They started off making animal feed (10 to 12 different formulations just for young pigs alone if I got that right) and then later added a Mother Barn for momma pigs (sows) having babies (farrowing) up thru weaning (3 weeks for piglets vs 3 years for my daughter). [For a peek at how hogs are raised after weaning, please see Heather's visit to Uncle Squeals' operation.] The Mother Barn is biosecure--that means showering in and out to keep the hogs healthy and the pork free of antibiotics. The Surber family hosted this farm dinner, but it sure was a group effort. The event was coordinated by Heather, The Food Hussy, aka my pork pimp. I met two more fellow Ohio food bloggers, Nicole of Brown Sugar along with her darling son and her mom, and Jill the Foodtastic Mom along with her enthusiastic kiddos. 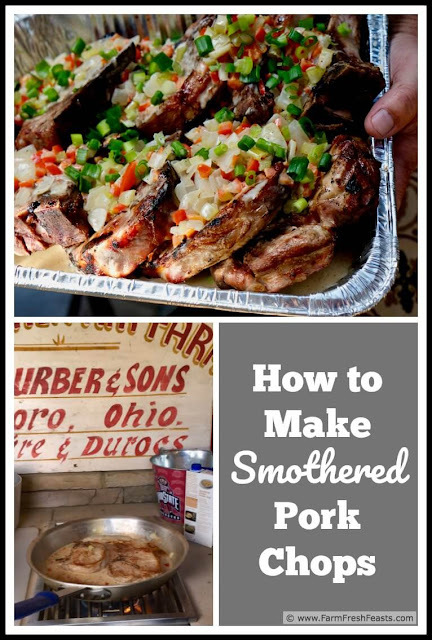 After John & Connie, and Neil Rhonemus (Uncle Squeals himself) talked about raising hogs, Chef Matt and Chef Jeff of Colonel De Gourmet Herbs & Spices shared how to cook several cuts of pork. Pork is so versatile and Chef Matt and Chef Jeff did a terrific job highlighting this fact. First off, Chef Matt demonstrated smothered pork chops. Next, they switched gears and cuts of meat to demonstrate the technique for making schnitzel from pork loin. Finally, Chef Jeff grilled pork sliders served with sautéed mushrooms and a smoked gouda mayo. 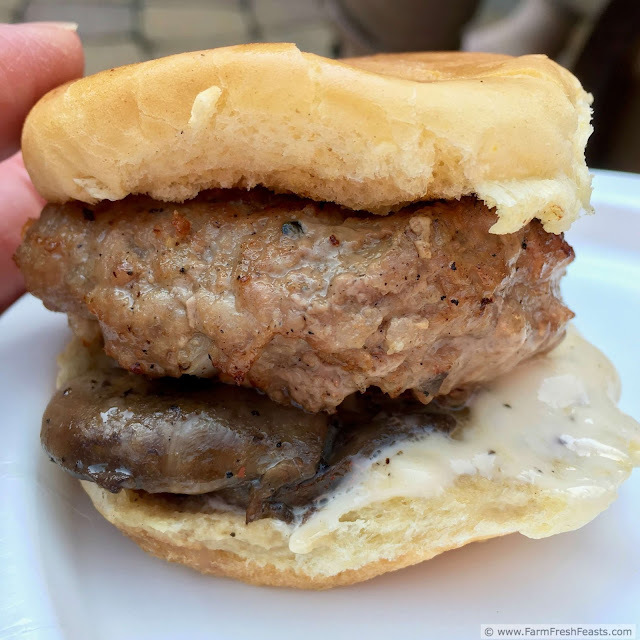 I'm sharing one recipe below, because that's the one I got the best pictures of, but if I had to pick a favorite I'd go with the sliders because I'm smitten by the smoked gouda mayo and the flavor of sautéed mushrooms with ground pork. All good meals end with a sweet finish, and our farm dinner was no exception. Casey McIntosh of Batter Up Bakery in Leesburg, Ohio provided 2 types of desserts and, in the interests of fairness and accurate reporting I sampled both. I'm delighted with Casey's business model--the bakery's ingredients, from eggs to berries to leaf lard, are locally sourced. Casey brought a triple berry cobbler (so good!) and parfaits. This is such a great idea for entertaining! She made one type of cake (lemon), 2 types of buttercream (almond and raspberry), and 3 types of fruit sauces (strawberry, blueberry, and raspberry). After that, she assembled an assortment of individual parfait glasses with various combinations of sauce, cake, and buttercream. I tried the raspberry sauce with lemon cake and almond buttercream and it was wonderful. I like to watch videos of people cooking. Not so much for what is being cooked (I can search for recipes with the best of them), but more for how. The little tips and tricks that come to light while folks are doing what they know and love. Even though cooking is both my job(s) and my hobby, I'm constantly expanding my knowledge base by observing how other people cook. With that in mind, I had my phone out and recorded Chef Matt while he prepared Smothered Pork Chops, and I've clumsily edited a highlight reel for your enjoyment and education. Season the pork chops with Colonel's Bayou Blend. In a large skillet set on medium high heat, warm the oil. Add the chops and cook, turning once, until browned on both sides, about 3 minutes per side. Transfer to a plate to rest. Reduce the heat to medium and melt the butter in the skillet. Add the onion and cook, stirring occasionally and scraping the browned bits from the bottom of the pan, until the onion is translucent, about 3 to 5 minutes. Add the bell pepper, celery, the white portion of the green onions and the garlic. Cover and cook, stirring occasionally, until the vegetables are tender, about 8 minutes. Add the thyme and flour and stir well. Gradually stir in the broth and bring to a simmer. 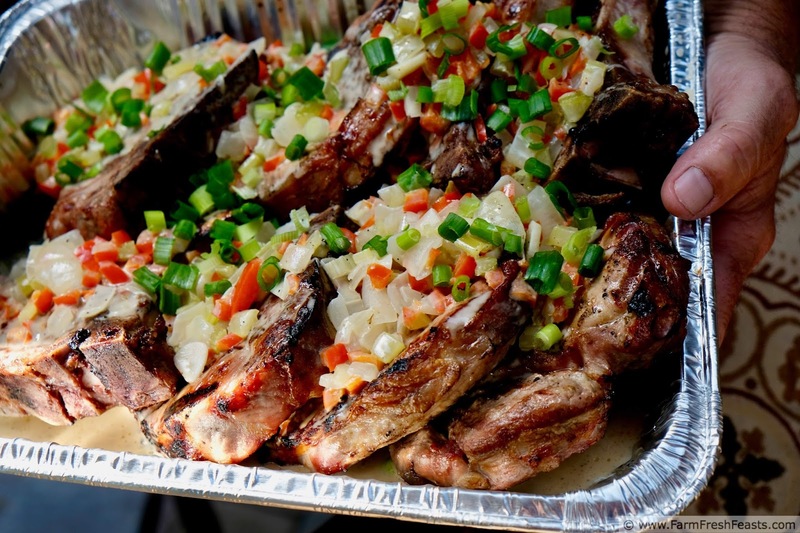 Return the pork chops to the skillet and reduce the heat to medium-low. Cover and simmer for 5 minutes, then turn the chops over, cover and simmer until the pork reaches 145 degrees and has a blush of pink when pierced at the bone, about 5 minutes more. Transfer the chops to a deep platter and cover loosely with aluminum foil. Stir the cream into the gravy in the skillet and bring to a boil. Cook until thickened and saucy, about 4 minutes. Stir in the green portion of the green onions and the optional hot sauce. Taste the sauce, and add more salt if needed. 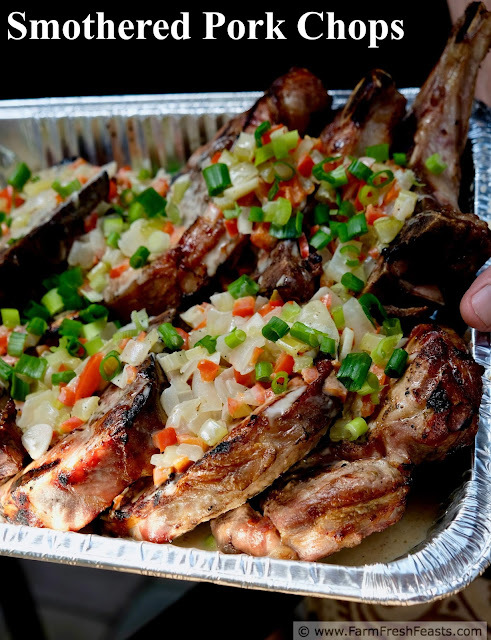 Pour the gravy over the pork chops and serve immediately with steamed rice, noodles, or a side salad. Pass more hot sauce at the table. Change it up--use diced carrot, celery, and onion with white wine and herbs de Provence. Or onion, garlic, and tomatoes with Italian seasoning and tomato sauce. *I'm giving this amount as a baseline. If you like things spicier, add 1½ teaspoons of Bayou Blend. If you're not so sure, go with ½ teaspoon. To be clear, the Ohio Pork Council has compensated me for my time as well as fed me deliciously, as shown in this post. It all looks delicious. Good luck with working with Council and thanks for sharing. Thank you! Working with the Council is a wonderful opportunity and quite tasty, too!